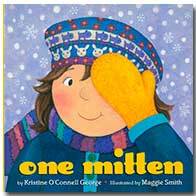 "George has a real knack for choosing ordinary moments and describing them in accessible yet lyrical language, transforming the mundane into the magical." "George's images are quiet but startling in their simple beauty ... For this poet, inanimate objects are equally miraculous." "An astute observer, George resists the obvious ... A dozen words or so are bound into small parcels; even as the contents are unwrapped, there is room for the imagination." 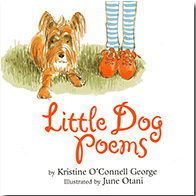 "George conveys a deep understanding of nature ... in a way that is readily accessible to children"
"... a fresh new voice that speaks the language of real poetry..."
Kristine O'Connell George is one of the principal voices in contemporary children's poetry. 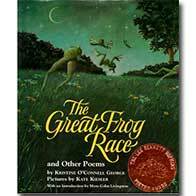 Since her first highly-acclaimed book, The Great Frog Race was published in 1997, Kristine O'Connell George's poetry has generated excitement and earned honors and praise. 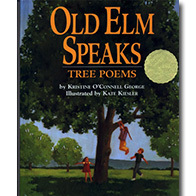 Awards for her books include the Lee Bennett Hopkins Poetry Award, International Reading Association / Lee Bennett Hopkins Promising Poet Award, the Golden Kite, Myra Cohn Livingston Poetry Awards, Claudia Lewis Poetry Awards, ALA notables, NCTE notables, School Library Journal Best Books, Hornbook Fanfare, Oppenheim Toy Portfolio Gold Award, and IRA-CBC Children's Choice. 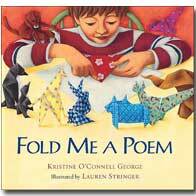 George says she "fell in love with children's poetry" in 1989 in a children's poetry writing class taught by Myra Cohn Livingston for the UCLA Writer's Program. 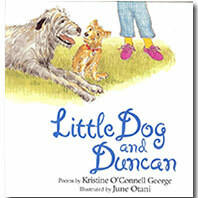 George studied with Livingston until her death in 1996 and has taught courses on writing poetry for children at the UCLA Writer's Program where she first met Livingston. 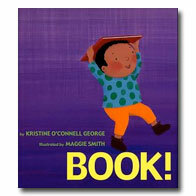 George served as poetry consultant for PBS's Storytime, is a board member emeritus for the Children's Literature Council of Southern California, and received an International Reading Association "Celebrate Literacy" award from the Foothill Reading Council. 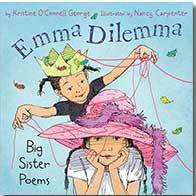 She is a member of educational and writers' organizations including PEN, The Author's Guild, and the Society of Children's Book Writers and Illustrators. A frequent speaker at conferences, George also enjoys visiting schools, conducting poetry enrichment workshops, and sharing her enthusiasm for poetry with students of all ages. 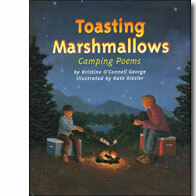 Lesson plans on themes and travel memoirs using Toasting Marshmallows: Camping Poems The Mailbox Bookbag June/July 2002. I live with my family in a rural area in the Santa Monica Mountains of southern California and often find poetry in my own backyard. The owl roosting in our 300-year old native oak, the packs of coyotes howling at night, the neighborhood peacocks, and the frog who lives on our front porch all seem to find their way into my work. Someday, I think I'll write about the raccoon who played with the dog's toys in the yard at 2 a.m. Or the skunk family . . . I was born in Denver, Colorado and my family moved often when I was growing up. 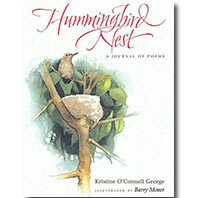 Memories of my homes in Colorado, Idaho, Ohio, Oregon, Texas, and California are sources of inspiration for my poetry. In addition to writing (which I love! 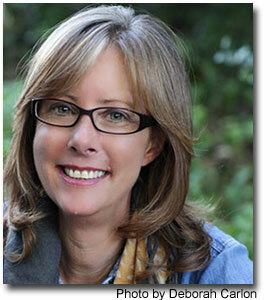 ), I have more hobbies than free time: tennis, golf, hiking, photography, collage, watercolors, gardening, sewing ... I am a voracious reader and books keep company with unfinished craft and art projects in every corner of my house. I am never bored. Are you wondering about that frog in the picture? Meet Studebaker! When we visit schools together, Studebaker gets petted, patted, and smothered with kisses. He even gets his own fan mail. Paper mach� artist, Karen Croner, designed Studebaker for me to celebrate my first book, The Great Frog Race. I think Studebaker is incredibly handsome. 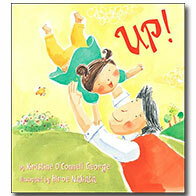 However, if you meet him, please don't tell him I said so - he is getting quite "uppity!" Being a writer didn't cross my mind until I was in my early 30's. I studied science in school and wanted to be a marine biologist, a botanist, or a virologist. Or, a drummer in a rock and roll band. 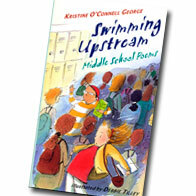 I have always liked listening to poetry and I wrote a lot of poetry when I was in high school. However, I truly fell in love with poetry in 1989 when I took a class on writing poetry at the UCLA Writer's Program. The class was taught by the famous poet and anthologist, Myra Cohn Livingston. I studied with her for seven years and have been writing ever since. Everywhere! I never know when an idea will turn into a poem. It might be something I see, an overheard comment, something I've been wondering about. Our world is a fascinating place and ideas are everywhere. I keep a "writer's notebook" and scribble down interesting things; many of my poems come from that notebook. Here's the best advice I've ever received: Read everything you can and write as much as you can. Learning to write is like any other skill — you get better with practice. And, if you are writing poetry, remember to read your work out loud. Poetry is meant to be read aloud and you'll be surprised how much better you can make your poems when you read them aloud and listen carefully to your words. One more thing: Use a "writer's notebook" to capture those great ideas that flit through your mind. I write just about anywhere. My favorite place to write is sitting on my back patio. What is your favorite of all your books? It's hard to play favorites and all of my books are special to me for very different reasons. I think my "favorite book" is whatever I'm working on right now. Rewriting! I love to play with ideas and words and see what happens. Rewriting can be frustrating but it is also very rewarding. Hmmmm.... I'm working on several poetry collections and working on a novel. Yes, I am actually writing sentences! Yes, I have one daughter. Her name is Courtney; she also likes to write and plays flute, piano, and guitar. Do you really raise tadpoles? Yes! Every spring we go down the river and collect tadpoles; it's amazing to watch them grow into frogs. Did you know that tadpoles like spinach? 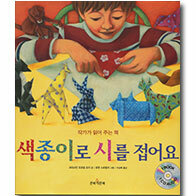 I love to read, garden, take photos and video, do crafts and make big messes. I also hike, play very bad golf, and tennis. 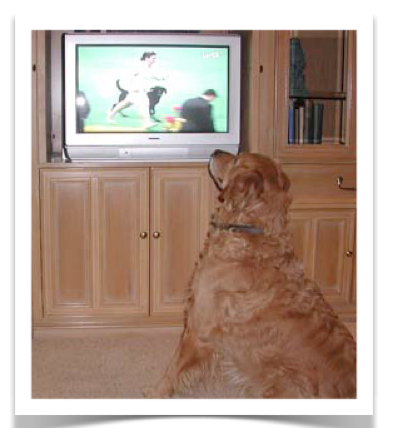 This is Riley--watching the Westminster Dog Show. This is not my favorite question! <smile> Here's a big hint: I was fifteen years old the summer that Apollo 11 landed on the moon. I remember staring at the moon and wondering what it would be like to actually walk on the moon. Here's another hint: The year I was born, Roger Bannister broke the record for the mile. His time was 3:59:4. Hmmmm.... Let's see.... I share a birthday with poet, Randall Jarrell who wrote The Bat Poet, one of my favorite books! My birthday is also the same date as National Teacher Day and No Homework Day. Seriously! I hope I've answered your questions!